This statistic presents a ranking of the most popular Instagram accounts as of October 2017, sorted by the highest numbers of followers. 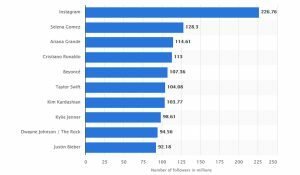 Singer Selena Gomez was the most-followed person on the photo sharing app platform with more than 128.3 million followers. 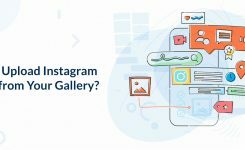 Instagram is a photo-sharing social networking service that enables users to take pictures and edit them with filters. The platform allows users to post and share their images online and directly with their friends and followers on the social network. As of September 2017, the cross-platform app reported more than 800 million monthly active users. 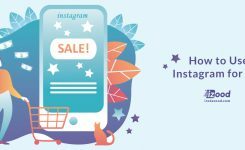 Currently, there are more than 85.5 million Instagram users in the United States and experts project this figure to surpass 118 million users in 2021. Instagram audiences are predominantly young – recent U.S. data states that half of Instagram users are aged 34 years or younger. Spring 2017 data reveals that Instagram is also one of the most important social networks of teenage internet users and one of the most-visited social networks among teenagers in the United States. 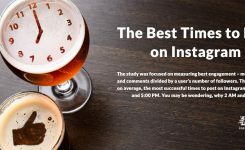 Brands are keen to reach Instagram audiences as users of the social network show high engagement rates with the displayed content. As of February 2017, the most popular fashion brand on Instagram, Nike, had over 69 million followers on the social network. Other popular fashion brands were Victoria’s Secret, Nike Football, and H&M.